and HeT-A are essential components of D. melanogaster telomeres (see Subheading 3.4.). 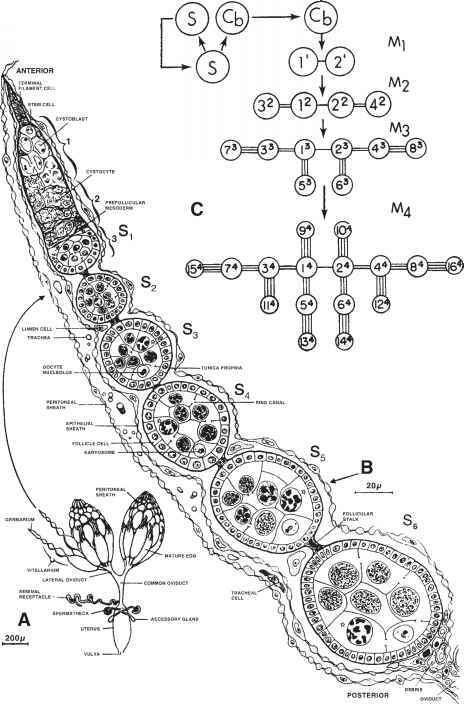 P transposable elements only very recently (in the last 100 yr) took up residence in D. melanogaster, having found their way into the genome by horizontal transfer from an external source (e.g., see refs. 104,105). Although the P element is not a significant TE in the evolutionary history of D. melanogaster, in the last 20 yr it has been of incalculable value as a tool in molecular genetics, having revolutionized approaches to mutagenesis and methods for analyzing gene function. The telomeric DNAs of most eukaryotes consist of tandem arrays of a short sequence motif (e.g., [TTAGGG]n in vertebrates) synthesized by a reverse tran-scriptase, telomerase. The telomeres of Drosophila, and apparently of Diptera in general, are exceptions (see refs. 106-109). D. melanogaster telomeres not only lack such short canonical repeats, but the fly genome does not encode a telomerase. Instead, the ends of D. melanogaster chromosomes consist of head-to-tail arrays of two telomere-specific retrotransposons, TART and HeT-A, produced by rounds of transposition events that counter chromosome-end erosion. (Drosophila telomeres lose an average of 2 bp per DNA strand per replication cycle, approx 70-75 bp per fly generation; see refs. 109-111). Both TART ("telomere-associated retrotransposon") and HeT-A belong to the non-LTR (long terminal repeat) family of retrotransposons (112-114). Full-length TART elements are approx 12 kb and have four sequence domains, including open reading frames (ORFs) encoding a reverse transcriptase and retroviral gag-like protein. There are approx 5-10 TART elements per haploid genome, scarcely enough for each and every chromosome tip. Indeed, in some nuclei there may be telomeres without a TART element, and in a population of flies, both the number and order of HeT-A and TART elements may vary for any given chromosome end (115). chromosome of D. melanogaster, suggesting a possible telomeric origin for the Y centromere (117). Short (<1 kb) repetitive DNAs called telomere-associated sequences (TASs) occupy a transition zone between the distal HeT-A/TART elements and the proximal, gene-encoding part of each chromosome arm (69,115,118-120); chromosome 4 may be an exception, with its transition zones possibly consisting of transposons instead. Genetically marked transgenes integrated into TAS arrays show PEV, indicating that these regions are in a heterochromatic state (69,119,121,122). Indeed, HP1 is found at all chromosome ends and its presence there helps prevent telomere-telomere fusions (123). The mechanism by which TART and HeT-A elements are specifically targeted to receding chromosome ends and its regulation are not known, but almost certainly involve telomere-telomere associations (e.g., refs. 119,121). Golubovsky et al. (121) suggest that pairing of homologous telomeres would allow each telomere to "assess" the condition of the other and stimulate HeT-A promoter activity and transposition if end elongation was required. HeT-A transcript, synthesized by RNA polymerase II, is present in both the nucleus and cytoplasm at high levels in both the male and female germ lines, at lower levels in proliferating larval cells, and is not detected in polytene cells of larval salivary glands (see refs. 119,124). Transcription of TART is more complex (124). An intriguing dominant mutation, Telomere elongation (Tel), causes unusually long telomeres to be formed on all chromosome ends (125), identifying the Tel+ gene product as a likely candidate for a trans regulator of telomere length. Tel elongated telomeres are highly enriched for HeT-A elements, and TART elements are also enriched but to a smaller degree. In both polytene and mitotic nuclei, the mutant chromosomes show a striking propensity to associate end to end. Such interactions are transient in mitotic cells because those seen at metaphase are dissolved at anaphase (125).